Didn’t think it was possible to give Halters a NEW more modern, effective design? Well think again! The WORLD’S BEST HALTER is just that— the world’s BEST! Once you try it, you'll never want to go back! How Did The World’s Best Halter Come To Be? How did the World’s Best Halter come to be? It all started with a dream… no, really— a DREAM! Have you ever had a dream that was so real, when you woke up, you were surprised to find it was actually a dream? Well, that's what happened to Danny Shelton, lifelong horseman and creator. I had a dream that was so real, when I woke up, I instantly continued my train of thought from the dream! I dreamed I was talking to someone who said to me, "Isn't it amazing that everything in life has changed in the last 100-150 years?" Then he continued, "Well, you would know that because you work in high-tech equipment everyday in your television network". Then I heard myself, in the dream, say to this anonymous person . . . "Not everything in life has changed. I can think of two things that have not changed in the last 100 years or so . . . horseshoeing and horse halters. I can't help you with shoeing horses, BUT I have invented a new horse halter that will revolutionize the equine industry. It has an instant control locking system AND it's the only halter in the world that you can lengthen or shorten while still on the horse and not lose control of him"! Three hours later, a friend of mine who builds most of the garbage and concrete trucks in America called. I asked him what project he was working on, and he proceeded to tell me that he was working with his engineers designing a robot to do welding on his tankers. I was so surprised that I asked, "You have engineers who design robots?" Then he said to me, "Danny, there's nothing my guys can't design!" Wow, I got so excited I started telling him about my early morning dream. Well, the long story short . . . I made a prototype, flew to Minnesota . . .
Can You Imagine A Halter That Has All These Features? * An instant-catch locking system! * That prevents losing control of your horse while lengthening or shortening it, while on the horse! * That doesn't require you taking your gloves off in the winter while installing it! * So easy that physically challenged equine lovers can put on and take off by themselves! * So easy a 3-year-old old child can place it on their miniature ponies all by themselves! * That's made in America! * With all stainless steel parts! * That will last for years to come! What Do Horse People Say About The World’s Best Halter? 1. I saw, for the first time in my life, an equine halter that you never lose control of the horse while lengthening or shortening the halter. 2. This halter is called the "quick catch." The buckle does not have a latch that needs to be threaded through the hole before control takes place. As soon as the head strap passes through the buckle of the halter - you are in control of the horse! 3. And the icing on the cake is that there are no movable parts . . . nothing to bend, rust, or break! How Much Does The World’s Best Halter Cost? Well, that is the best part! Even though this halter is truly the “World’s Best”… doesn’t mean it isn’t affordable! 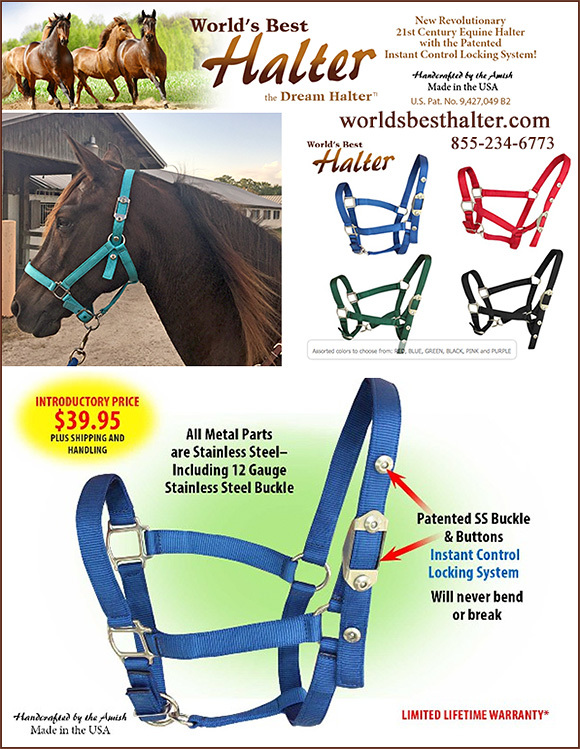 At only $39.95 and sizes fitting horses from 500-1500 pounds (in almost every possible color), EVERY horse owner can afford to have the WORLD’S BEST HALTER at their stable or farm! Make Sure You Have The WORLD’S BEST HALTER For Your Horses and ORDER Today! Halters are a part of daily life for almost every horse. Literally, they are the most used piece of equipment your horse will use. Make sure YOUR horse has the WORLD’s BEST HALTER and call and talk to Danny today to order yours. Don’t forget, the WORLD’s BEST HALTER can make the perfect GIFT for the horse lover in your life too!